A ZBC camera was damaged by rain yesterday after MDC Alliance supporters attending a rally at Mucheke Stadium in Masvingo yesterday grabbed the umbrella that was shielding it. It took the intervention of party’s presidential candidate, Nelson Chamisa to get the umbrella back. 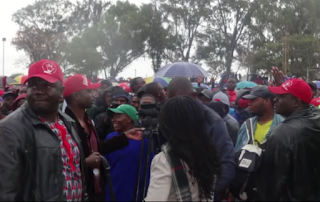 At a time when the media has been walking the path affording all political parties coverage as mandated by the constitution and electoral laws, the ZBC Masvingo news crew had a torrid time with the opposition party’s rowdy supporters. The party supporters snatched the umbrella demanding the crew to leave the spot, forcing Chamisa to momentarily stop his address and demand that the group returns the umbrella. Turning to his address, Chamisa continued with his promises saying if elected into office, he will introduce a multi-currency system, something already functional in the Zimbabwean context. It was equally a departure from his utterances at some rallies where he has spoken about bringing in a currency stronger than the Bristish pound or the US dollar. Chamisa also told his supporters that he will also work on ensuring the country’s transport sector is revitalised. The MDC Alliance leader expressed confidence of winning the elections but also accused the Zimbabwe Electoral Commission (ZEC) of being biased towards Zanu PF.